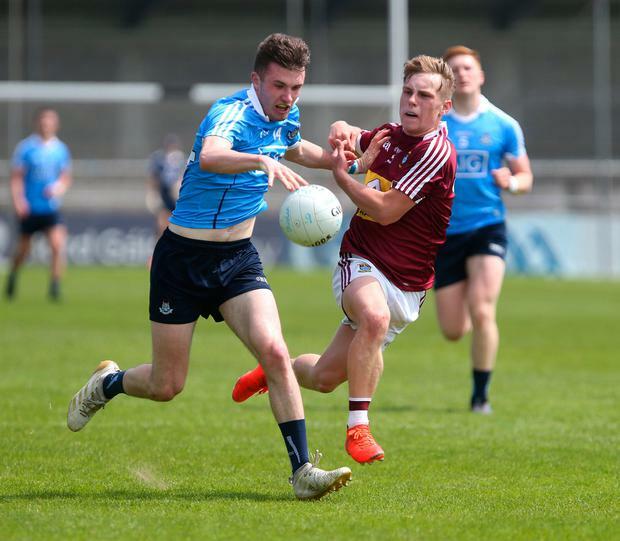 Two goals from James Doran, both within 20 seconds of the start of each half, set Dublin up for victory in this Leinster U-20 FC at Pairc Tailteann. Dublin led by nine points at one stage in the opening half but had to settle for a 1-8 to 1-5 interval after Frank O'Reilly netted from the penalty spot for Meath on the stroke of half-time. Further goals from Ross McGarry and Karl Lynch Bissett put the issue beyond doubt in the final quarter. Scorers - Dublin: T Keane 0-7 (2f), J Doran 2-1, R McGarry 1-4 (1f), K Lynch Bissett 1-0, S Bugler 0-2, C Howley, D O'Brien 0-1. Meath: J Morris 1-4 (3f), F O'Reilly 1-2 (1-0 pen, 1f), E Devine, J Conlon, S Walsh, A Kealy 0-1. Dublin: D O'Hanlon; N Nolan, N Doran, C Smith; K Kennedy, N Matthews, E O'Dea; D Ryan, S Bugler; J Madden, J Doran, C Howley; R McGarry; D O'Brien, T Keane. Subs: S King for Kennedy (BC 20), G McNamara for Nolan (44), K Lynch Bissett for Howley (48), J Holland for Doran (52), E Fitzpatrick for Ryan, C Hynes for Keane (both 56). Meath: A Beakey; R Clarke, C Harnan, K Slavin; E Smyth, E O'Kelly Lynch, J Cassidy; D Campion, A Murphy; J Scully, E Devine, F O'Reilly; J Conlon, S Reilly, J Morris. Subs: S Walsh for Reilly (h-t), S Ryan for Cassidy (37), A Kealy for O'Reilly (54), S McDonnell for Slavin, B McGowan for Devine (both 56), B O'Reilly for Smyth (59).